Glending Olson, in his 1979 essay ‘Making and Poetry in the Age of Chaucer’, showed that poetry in the later Middle Ages predominantly meant writing about ‘classical lore’ (p. 278), often writing metaphorically and allegorically, an activity with moral and philosophical purpose. This definition of poetrie is confirmed in Sarah Kay and Adrian Armstrong’s 2011 discussion of verse and poetrie in Knowing Poetry: Verse in Medieval France from the ‘Rose’ to the ‘Rhétoriqueurs’ (pp. 9–13). Kay and Amstrong define poetry as ‘a style of writing that relies on figural complexity, and is potentially expressive of philosophical meaning […] The features that typify poetrie are the use of classical myths, sustained personification, or forms of extended metaphor: devices constitutive of what we might call allegory’ (p. 9). Poetry doesn’t thus refer to verse form (Christine de Pisan can write poetry in prose, for example) but to a particular type of content and mode. In Middle English verse, the words poesie and poetrie often appear in rhyme position, needed perhaps more for their sound than for their precise semantic content. The Middle English Dictionary entries capture most of the ways in which I have found poesie and poetrie being used, though if I were re-writing the entry I’d reallocate some of the citations to different senses. I have been looking at Middle English usages of poetrie and poesie (and also poetical as an adjective) in order to find out whether these words ever refer to the formal component of verse. It turns out that these words DON’T seem to specify form in Middle English, but what they do specify is interesting nonetheless. Poetrie/poesie can refer to ancient classical writing, especially that using metaphor or other figures of thought, and that which was interpreted allegorically (especially Ovid, Virgil, and Boethius’s citations of classical myth in the Consolatione). Gower restricts his use of the term in the Confessio to references to Ovid’s stories. It can also refer to the myths themselves (and especially elements obviously fictive, fabular or supernatural), for example in Chaucer’s Squire’s Tale where it is one of the various methods by which Cambyuskan’s court try to understand the nature of the brass horse. 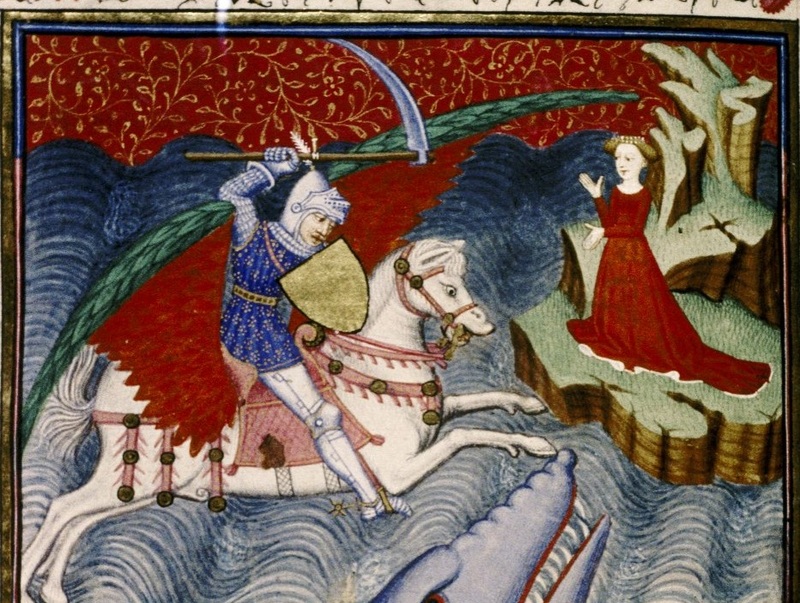 Some courtiers mention ‘olde poetries’ (V.206), comparing the horse to Pegasus who was created in some extraordinary fashion from Medusa’s blood. Poetrie/poesie also designates stories which involve metamorphosis, whether stellification or transformation from mortal into animal or object. It can refer to allegory and figurative language itself, particularly the qualities of obscurity or difficulty associated with the interpretation of these figures (often referred to as misty or dark). The Eagle in Chaucer’s House of Fame says that whilst rhetoric has ‘colours’ and philosophy has ‘termes’, poetry has ‘figures’ (857–59). The terms appear conspicuously at moments when late Middle English poets scrutinize their own ability or inclination to write poetrie/poesie. In the Invocation which begins the final book of Chaucer’s House of Fame, the narrator says that (despite calling on Apollo for help) he doesn’t intend that he will demonstrate ‘art poetical’ (1095) in what follows. The Invocation to Apollo draws on Dante’s similar invocation which begins the Paradiso, though Chaucer omits Dante’s references to Marsyas and Daphne. Whilst ‘art poetical’ refers forwards to the following apology for the poem’s ‘lyght and lewed’ verse, which will need Apollo’s help to be made ‘agreable’ even if a line is a syllable short (1096–8), it also acknowledges Chaucer’s omission of Dante’s poetrie, his use of classical myth. The narrator does not aspire to be crowned with the laurel wreath of a poet, as Dante does, but will more meekly kiss the next laurel tree he sees. 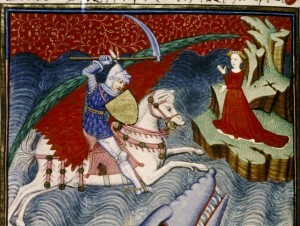 In Chaucer’s description of the authors who wrote on Troy, stood on their pillars in the House of Fame, the narrator famously notes the rivalry between the writers, especially an unspecified one who says that ‘Omer made lyes, / Feynynge in his poetries’ and thus Homer’s version is ‘but fable’ (1477–8). The unnamed poet is here saying two things rather than one: not only that Homer was biased towards the Greeks and hence presented historical untruths, but also that he did this whilst ‘feynyng in his poetries’ (i.e. he lied when inventing material in his fictions). This draws on the discussion of Homer in the Prologue of Guido delle Colonne’s Historia destructionis Troiae. Though Guido disapproves of Homer’s bias, he also acknowledges the difference between writing about Troy using poetic licence, ‘dealing with it lightly as poets do, in fanciful inventions by means of certain fictions’ (trans. Meek), as opposed to writing about it as a historian. Guido cites as one such fanciful invention the presence of pagan gods as actual combatants in the battles. Thus Chaucer’s unnamed Trojan author says that Homer was biased and inaccurate and that Homer allowed himself poetic licence. Later Middle English allusions to these lines often conflate the two elements into one conclusion, that the poetries are lies, but really they are two different sorts of lies. Chaucer also uses these terms at the end of Troilus and Criseyde. The narrating voice tells his little book not to rival other makings (that is, other vernacular compositions), but to be subject to ‘alle poesye’ (V.1790), especially the authors named in the final line of the stanza, Virgil, Ovid, Homer, Lucan and Statius. When the narrative voice dismissively gestures at the ways in which his poem illustrates the futility of the pagan in contrast to the Christian, he claims that his book contains ‘the forme of olde clerkes speche / In poetrye’ (V.1854–5), referring both to the whole work and to the naming of ‘Jove, Appollo, of Mars, of swich rascaille’ in the previous line. Both of these references, as Olson and others have argued, nonetheless make some sort of implicit claim that Troilus and Criseyde should be evaluated as an example of poetrie/poesie. John Walton, in his 1410 Middle English verse translation of Boethius’s Consolatione, worries about himself as a Christian author devoting his time to ‘Þese olde poesyes derke’, which renew (i.e. keep alive) ‘fals goddes names’. Hoccleve in the Male Regle names as ‘poesie’ (262) the attractive words of Flattery, which he compares to the song of the sirens or mermaids who tried to lure sailors to wreck their ships on rocks. Just as Ulysses (who was curious to hear the sound of the songs) bound himself to the ship’s mast and plugged the ears of his men with wax, so lords should block their ears and not listen to Flattery’s ‘poesie’. But beyond its monitory purpose, the word here also draws curious (and perhaps self-scrutinizing) attention to Hoccleve’s own use of poesie here, citing the story of Ulysses, as well as the metrical Latin version of the Physiologus by Theobaldus and Robert Holcot’s commentary on the Old Testament book of Wisdom. Many of Lydgate’s uses of poesie are likewise pointedly specific rather than generic. In the Temple of Glas, the narrator sees painted, amongst many other narratives, ‘al the poesie / Of him, Mercurie, and Philologye’ (129–30). This is Martianus Capella’s Of the Marriage of Philology and Mercury, a work noted for its allegory and difficult figurative style. In the Siege of Thebes, Lydgate cites Boccaccio (in the Genealogie deorum gentilium) as clearly expounding the ‘derke poysye’ (I.214) of Amphion raising the walls of Thebes by playing Mercury’s lyre. Lydgate himself is about to likewise interpret this poesie (in the sense of an extraordinarily fictive event) as a piece of advice for princes: kings can do more by eloquent and humble speech than by power and violence. So the mention of poesie reflexively acknowledges Lydgate both as having Amphion-esque eloquence and having the ability to interpret such myths. In the Troy Book, Paris, when describing Mercury’s appearance to him in the dream in which his judgment of Hera, Athena and Aphrodite occurs, says that Mercury appears ‘Liche as he is discriued in Fulgence, / In þe book of his methologies, / Wher be rehersed many poysyes’ (II.2486–88). This is Fulgentius’s Mythologies, a collection of myths with allegorical interpretations written in ornate Latin prose. Lydgate supplements the story as found in Benoit and Guido delle Colonne with interpretations of Mercury’s appearance derived both from Fulgentius and also from Ovid’s Metamorphoses. So again the word appears at a moment when Lydgate himself attempts poetrie (both narrating classical lore and interpreting it). John Metham thus rightly celebrates not only Lydgate’s ‘halff chongyd Latyne’ (i.e. his Latinate English) but also his ‘conseytys off poetry / And craffty imagynacionys of thingys fantastyk’ (Amorys and Cleopes, 2194–5). As well as these more specific usages, the terms do start to be used more generally. Following Chaucer’s indirect claims that his own work is poetrie or poesie in Troilus and Criseyde, and the Clerk’s celebration of Petrarch in the Canterbury Tales as illuminating Italy with poetry, fifteenth-century authors installed Chaucer himself as the corresponding illuminator of English verse, granting Chaucer the status of a creator of poetrie/poesie. Lydgate celebrates Chaucer’s verse as poetrie and Hoccleve in the Regiment of Princes too praises Chaucer for following ‘The steppes of Virgile in poesie’ (2089). The author of the Court of Sapience calls both Chaucer and Gower ‘experte in poetrye’. The term can also refer to Latin proverbs or heraldic mottos, or to short quotable Latin extracts used in a sermon. In Piers Plowman, Peace, one of the Four Daughters of God, ‘pipede […] of Poesie a note’ (B.18.408;C.20.451) when she is reconciled with her sisters. Peace squeaks a song whose words are a distich (a couplet combining a hexameter and a pentameter line) from the Liber parabolarum, a school text by Alain of Lille. As Wendy Scase argues in her contribution to the Cambridge History of English Poetry, Langland takes this squeaked bit of Latin and translates it skilfully in the lines that follow, matching Latin figures of speech with English verse techniques. Emily Steiner calls the translation ‘gorgeous’, ‘beautiful reasons simultaneously rhetorical and poetical’ in which ‘Atonement theology […] is rendered into literary art through an enterprising alliterative poetics’ (p. 209). Again, the word appears precisely at the moment at which Langland compares his own poetic art with a particular meaning of poesie (here both Latin distich and short quotable proverb). By the 1530s, poesie and poetrie have become potentially derogatory labels. Following on from pejorative uses in Lollard tracts to refer to the citation of classical proverbs or verses in sermons (with the sense that the meaning of these poesies or poetries are then expounded by priests showing off their classical knowledge), Sir Thomas More and John Bale use the terms to dismiss the words of Tyndale (in More’s case) and other verse-polemicists (in Bale): ‘soche other blynde Popishe Poetes and dirtye metristes whan they uttered their shitten [r]ymes and poesies’ (Bale, Image of Both Churches). Poetries and poesies are now invented, deceiving, dissembling lies. From the late fourteenth century to the mid-sixteenth, poetrie/poesie evolves in English from a label which poets can only apply tentatively or indirectly or anxiously to their work, often for the purpose of self-scrutiny, to a dismissive term of abuse.